Zambian Vice President Guy Scott has been named the interim leader of Africa's second-largest copper-producing nation, a government minister said on Wednesday. He succeeds President Michael Sata, 77, who died Tuesday in London, where he had been undergoing treatment for an undisclosed illness. 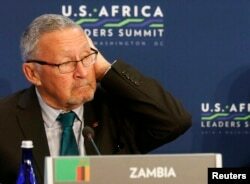 FILE - Zambia's new interim president is Guy Scott. Zambia will hold a presidential election to choose a permanent successor within three months, defense minister Edgar Lungu said. Scott becomes Africa's first white president since F.W. de Klerk governed South Africa from 1989 to 1994. The new Zambian leader, 70, was born in Zambia when the country was British-ruled Northern Rhodesia. Under the constitution, he cannot be president permanently because his parents were not born in Zambia. Last week, the Zambian government presented lawmakers with a new draft constitution that would eliminate that restriction. Sata, during his three-year term, promised to wipe out corruption and hold foreign investors in check. Even his critics say he got some things done, such as improving the nation’s infrastructure. His friends and colleagues praise him as a man of action. Even Michael Sata knew he was better known for his sharp tongue than for his populist policies as Zambia's fifth president. On his official, but rarely updated, Facebook page, the late president of the southern African nation wrote that as an up-and-coming politician, "my political style was described as ‘increasingly abrasive.' "
"He is called King Cobra because he gets things done. He strikes. ... If it is not done, he is thumping the table the next day," Scott explained when he was vice president. But the name also stemmed from Sata's numerous sharp ripostes – aimed at journalists, rivals and ordinary citizens. He even took a stab, in 2012, at former President George W. Bush, who he called a "young man" and a "colonialist." Scott said Sata's sharp teeth hid a steely determination. “I have no trouble getting on with him," Scott had said. "He likes growling, he likes making people wake up. He has got a complicated personality, but he has the loyalty of people who know him and work with him, and love him. He has a bigger, more loyal following than any other politician in Zambia." Sata was born a colonial subject in what was then known as Northern Rhodesia. He said he worked for a time on the railway system in Britain, though few details are available. He ran for president four times. In his final, successful campaign in 2011, he promised to crack down on corruption and rein in Chinese interests in the copper-rich nation. But Sata also had a softer side. His official biography from his party, the Patriotic Front, describes him as a family man and a dedicated Catholic. And, it said, despite his achievements as a police officer, pilot and politician, he was a populist at heart, attending mass in the vernacular and refusing on principle to drink bottled water until all of his countrymen have access to clean water. That was one of many of his goals he did not meet. According to UNICEF, more than a third of Zambians lack access to clean water. An organization called Zambian Watchdog gave the president across-the-board failing grades after 18 months in power, slamming him for disregarding the constitution and for lacking clear plans. The organization also acidly noted that Sata's "conduct home and abroad has been less than decent and impressive." Law Society of Zambia General Secretary Likando Kalaluka said that Sata improved the nation’s infrastructure, but added that his legacy would be "overshadowed by the delay in the constitution – the draft constitution." His last major appearance was before the Zambian parliament in September. Some material for this report was provided by Reuters.